1. Heat 1 tbsp of the olive oil in a frying pan, add the chorizo crumbs and the Tenderstem broccoli and sauté over a low-medium heat until the chorizo crumbs are starting to crisp and the broccoli is tender. 2. Meanwhile, toast the sourdough bread on both sides and rub one side of each slice with the garlic clove. Using a slotted spoon remove the chorizo and broccoli from the pan, leaving any excess oil behind. Keep everything warm. 3. Add the remaining tablespoon of oil to the pan and return to a medium heat. Break the eggs into the pan, add the sage leaves and season the eggs with black pepper. Fry, basting with the chorizo and sage oil, until cooked to your liking. 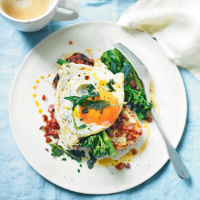 Spoon the chorizo and Tenderstem on top of the garlicky toast, top with a fried egg and the sage leaves and serve immediately.